Line a muffin tin with paper liners. 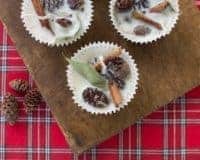 Fill each one with 1 bay leaf, 3-4 mini pine cones, a few pieces of broken cinnamon sticks, and about 1/2 teaspoon dried rosemary, and a few whole spices. Nestle one of the cotton wicks into the center of each well. In an old pan over medium heat, melt the wax flakes. Pour an even amount of wax into each well. If needed, gently press the items down so they are mostly submerged in the wax. (They don't need to be completely covered - just enough to hold them together.) Let cool completely. Remove the fire starters from the muffin pan. Store in an airtight jar or tin, or package individually to give away as gifts. To use the fire starter, place in the bottom of a fireplace between the logs. Light the wick.